A western Newfoundland woman is angry that a Sheaves Cove man who assaulted her has been sentenced to four months house arrest. Robert Rowe punched Shelley Jesso twice after she hit him first and broke his glasses, according to a judge in Stephenville provincial court Wednesday. CBC journalist Doug Greer reports Jesso is furious with the sentence. Jesso testified that Rowe beat her savagely on Aug. 25, 2009, while she was jogging on a road in Sheaves Cove, on the Port au Port Peninsula. She said the attack was unprovoked. In court, Rowe said he hit her twice after she hit him first. He said she was further injured when she hit a rock as she fell to the ground. 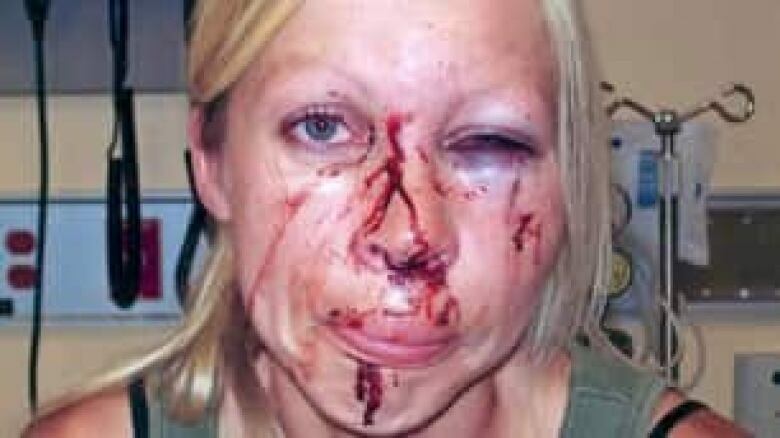 This is a picture taken of Shelley Jesso shortly after she was attacked while jogging in Sheaves Cove in August, 2009. ((Submitted by Travis Young))The RCMP said at the time of the assault that there was a long-running feud between the Jesso and Rowe families. Shelley told CBC after Rowe's sentencing that she feared the man would have beaten her to death if her father hadn't intervened. Judge Jacqueline Jenkins did not accept Shelley's account of what happened. Jenkins said the assault was an uncontrolled response by Rowe to Jesso hitting him and hurling profane insults at his wife. Rowe is a fisherman. His conditional sentence does not prohibit him from going to his place of work but it does stipulate that he must remain inside his house when he is not working – except for one hour per day.